The masonry walls is built of individual blocks of materials such as stone, brick, concrete, hollow blocks, cellular concrete etc., usually in horizontal courses cemented together with some form of mortar. The use brick and stone can increase the thermal mass of a structure. 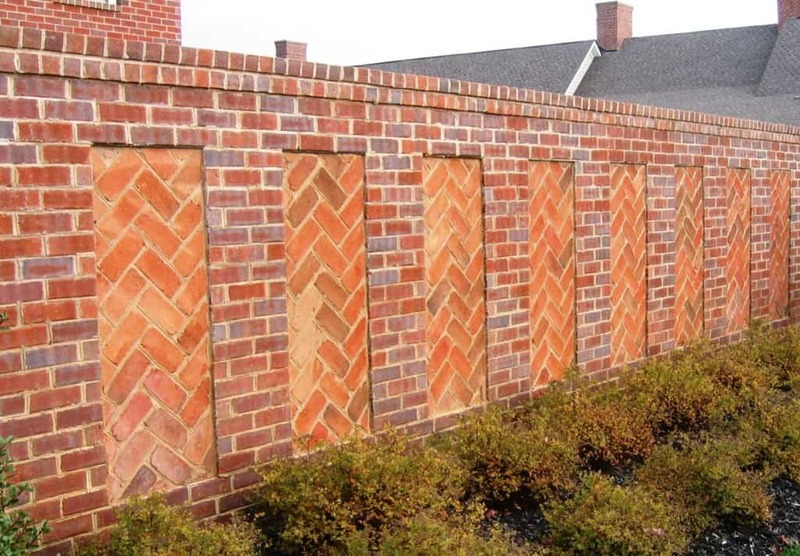 Brick generally will not require painting so it can provide a structure with reduced maintenance costs. It is very heat resistant & thus provides good fire protection. Walls made of masonry are more resistant to projectiles. 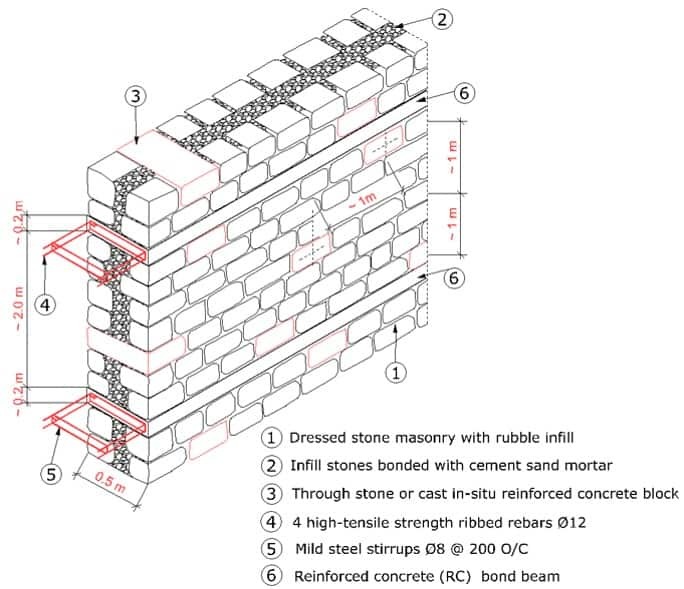 These structures designed for compression, preferably with lime mortar may have design life of more than 500 years compared to 30-100 for structures of steel or RCC. When a masonry wall becomes unstable, during a fire attack, and begins to lean inward, it is not necessary that the wall will fall in the same direction. Firefighting operations must maintain a safe distance between themselves & unstable wall. When a section of the broken wall falls inward, its lower portion may kick outward or upper portion may initially fall inward and then slide down outward. Known as an inward/outward collapse. This is the most common type of masonry wall failure during fires. Wall falls straight out & top of the collapsing wall hits the ground. The distance will be equal to the height of the failing section measured from the base of the wall. For example a 50′ wall collapsing in a 90-degree angle fall will cover at least 50′ of ground with brick. Steel lintels may bounce or roll out even farther. In this failure the wall begins to lean outward at the top thus separating from the other enclosing walls, and finally falls straight out at a 90-degree angle. In this collapse, an exterior masonry wall drops like a falling which is curtain cut loose at the top. The failing wall crumbles and falls straight down, forming a pile of bricks and mortar on the ground at the base of the wall. The collapse of brick veneer, or masonry-backed stonewall usually occurs in a curtain-fall manner. FEM: Method for numerical solution of field problems. FEM cuts a structure into several elements (pieces of the structure). Then reconnects elements at “nodes” as if nodes were pins or drops of glue that hold elements together. This process results in a set of simultaneous algebraic equations. Non linear problems easily solved. Easy formulations allow many different types of problems to be solved. There are reasons to consider the mathematical foundation of the finite element approximation more sound, for instance, because the quality of the approximation between grid points is very good. Macro-modeling Masonry – In macro-modeling masonry, no distinction between the individual units and joints is made, and masonry is considered as a homogeneous, isotropic, or anisotropic continuum. As macro-modeling of masonry is advantageous when the global behavior of the structure is important. The influence of the mortar joints acting as planes of weakness cannot be addressed. Micro-modeling Approach – The alternative micro-modeling approach, expanded units are modeled with continuum elements, while the behavior of the mortar joints and unit-mortar interface is lumped as discontinuous line interface elements . In this research micro-modeling has been adopted in preference to the macro-model. Finite Element Model Approach – In the finite element analysis, masonry is treated with micro-model, in which the units of brick and joints are modeled individually with different type of elements. 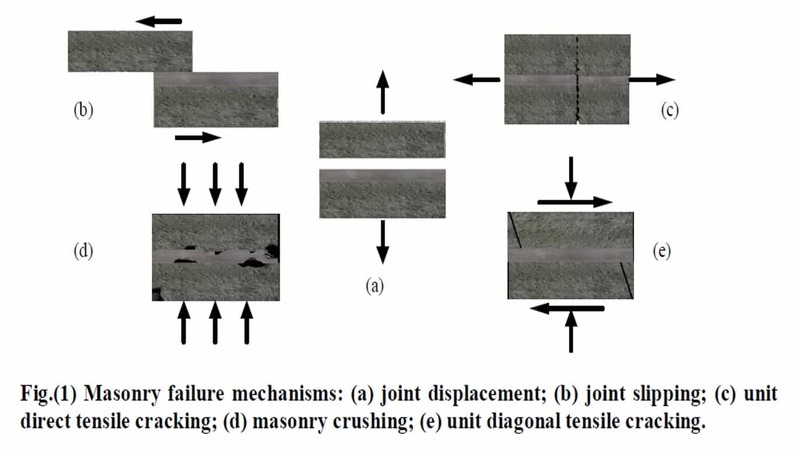 The masonry units are modeled with smeared crack elements, which account for both tensile and compressive fracture of the units, while the mortar joints are modeled with interface element to account for the inherent planes of weakness to include all the basic types of failure mechanisms that characterize masonry. This study presents an efficient finite element analysis technique which shows a great versatility in analysis complex discontinuities in the analysis of masonry walls structures by use of interface elements with a constitutive model entirely established on the basis of the incremental theory of plasticity to simulate the actual behavior at the interface between contacting materials. It was shown that the finite element method model was able to predict effectively the behavior of masonry structures, with both confined and unconfined masonry wall, as well as sufficiently accurate collapse load values. 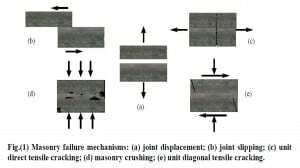 Jahangir Bakhteri et al (2004) carried out finite element modelling of structural clay brick masonry subjected to axial compression. To prove that for a normal case, where elastic modulus of mortar, Ej, is less than elastic modulus of brick, Eb, Increase in mortar thickness results in reduction of elastic modulus of the masonry, And increase of elastic modulus of mortar, which leads to an increase in the elastic modulus of masonry The models were assumed to be constructed from five local clay bricks having dimensions of 212 mm × 92 mm × 66 mm (length × width × height), and each model with unique mortar joint thickness. There were five sets of models having different mortar joint thicknesses, which were 7.5, 10, 12.5, 15, and 20.0 mm. 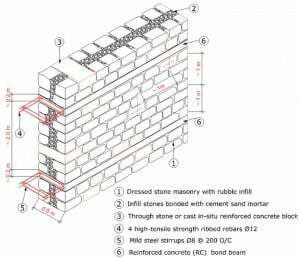 By increasing the mortar joint thickness, the strength of the masonry will decrease. The maximum compressive strength of models was obtained when the thickness of the mortar joint was 7.5 mm.